All NTS collection objects are marked with a number, and typically sets of objects all have the same number prefix. 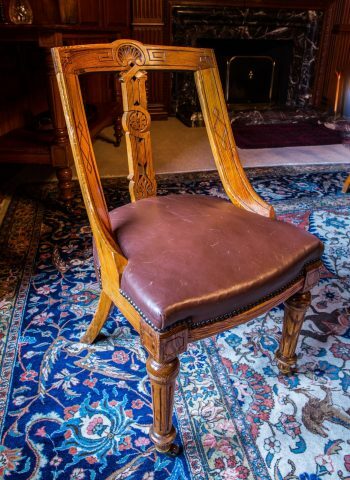 However, we found something odd in the gorgeous surroundings of Mar Lodge’s dining room: half of a set of dining chairs was marked with one number, and half with another, suggesting that the two halves weren’t related. To understand why, we had to delve into Mar Lodge’s rich history. The building that guests admire today dates from 1895, when it was built for Alexander Duff, 1st Duke of Fife, and his wife, Princess Louise, granddaughter of Queen Victoria and eldest daughter of Edward VII. The Duffs already had a family seat in Banff, and Mar Lodge was designed as a house for leisure. It was also conveniently close to Balmoral Castle, allowing Princess Louise to be near the rest of the royal family. The result was an impressive two-storey house, built by Alexander Marshall Mackenzie of Aberdeen, in a mock Tudor style. The interiors were furnished by a fashionable London firm of cabinetmakers called Maples, but nevertheless have a strong Royal Deeside character. 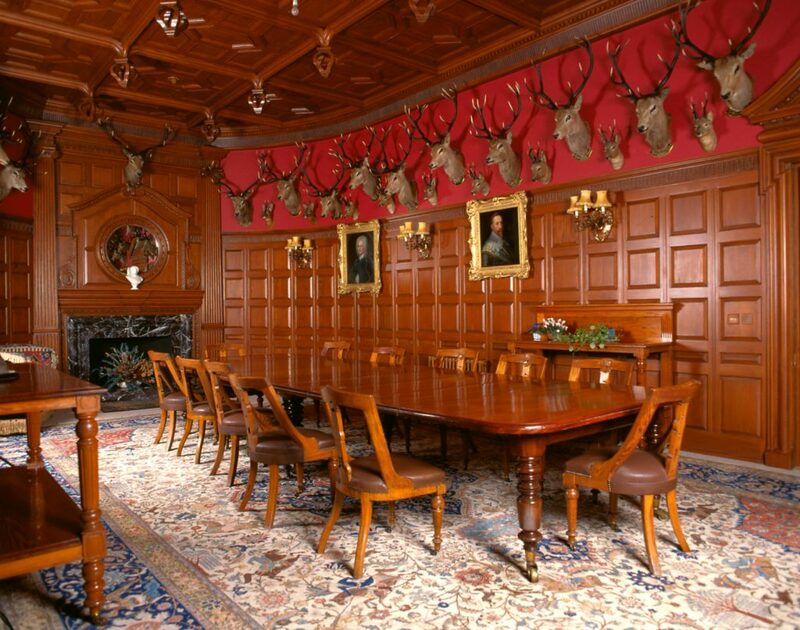 This is especially true of the dining room, where the table and the chairs are made of Scots pine, possibly from the estate, and the room is watched over by the silent gaze of mounted stags’ heads, shot by guests over the years. 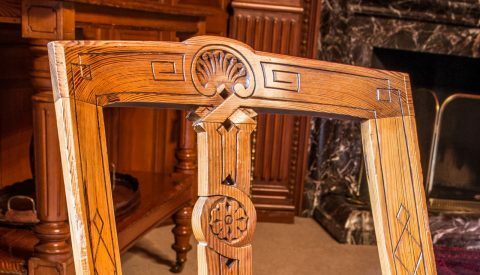 At first sight, the dining room chairs might seem quite simple for a ducal household, but the carvings are expertly done, with motifs in a classical vocabulary of shells, rosettes and geometrical shapes. To make the curved back requires skill, giving an elegant, unique look to the chairs. They were clearly to Princess Louise’s liking, and she is pictured seated on one of them in her sister’s photograph album in the Royal Collection (the second photograph from the left, on the second line). So how did the chairs come to have two different object numbers? The set stayed together in the dining room for many years, but when one of the later owners decided to build cottages on the estate, he moved some of the chairs to one of them. When he sold Mar Lodge Estate to the National Trust for Scotland in 1995, he sold these cottages separately, furnishings included. Although only a few miles apart, the two parts of the set now had different owners. The first inventory of the Lodge was made when the NTS acquired the estate, and the chairs in situ were given a number. In 2006, with the help of donations, the Trust was able to buy back the remainder of the set. They technically entered the collection for the first time and were given a new number, thus puzzling a clueless inventory officer ten years later! Guests at Mar Lodge can now see the full set together in the dining room, much as it would have been in Princess Louise’s time, looking as if nothing had ever changed. This article is by Marianne Fossaluzza, Project Reveal Inventory Officer, North East. Project Reveal is a multi-site digitization project of unprecedented scale. With your support, we can help the Trust manage its collections more effectively. Most important, we can help the Trust discover, better understand, and share its treasures with the world. This article was originally published by the National Trust for Scotland on December 1, 2017.